2017 - Return of the Monarch! 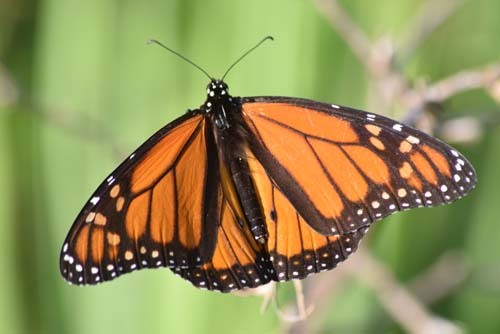 A mating pair of monarchs was seen in flight in our backyard in early August. The female was laboriously flapping her wings and quickly gaining altitude. The male appeared to not be contributing to the flight at all, apparently concentrating all his attention on the act of procreation. They disappeared into the top of a large pine tree and my attention was diverted to other things nearer the ground. In recent years, I have never seen two monarchs at the same time, let alone a mating pair. 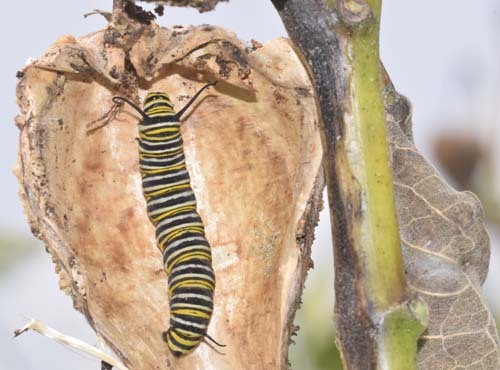 No monarch larvae had been seen on our property for several years prior to this, and very few adult migrants had passed through in previous autumns - and, all this despite the abundance of milkweed and flowering plants and no use of pesticides of any sort. 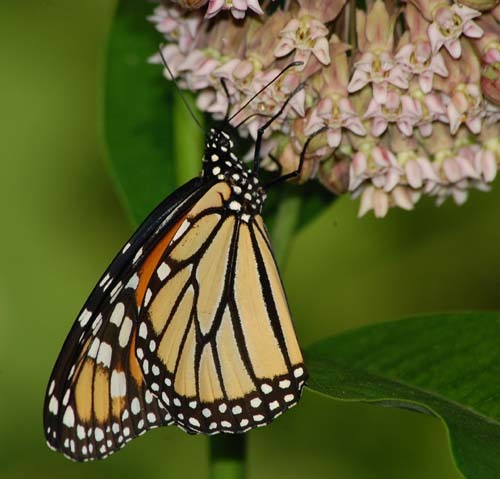 In mid-August, numerous monarch caterpillars and several eggs were found on milkweed in a small patch near the pine where the mating pair vanished. Was this the result of that one mating? Single adults were occasionally seen at the two nearby wildflower patches as well as elsewhere on our property. Several plants in this small patch had 5 or more caterpillars. 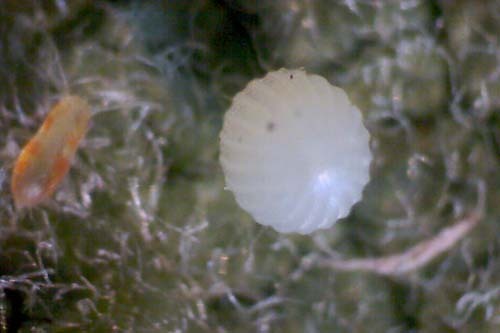 It appeared that if all eggs were laid by the same female, she made no attempt to disperse her eggs among the many plants, most of which were of similar quality and age. Aug 23 – The first two caterpillars found in the J position, ready to pupate were observed at opposite ends of the small milkweed patch. *11:08 am - The first caterpillar preparing to pupate was observed being attacked by a spined soldier bug. 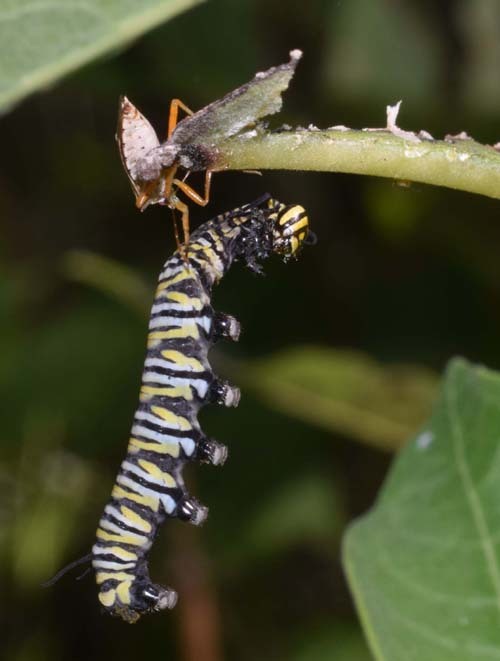 *1:29 pm - The second caterpillar in the J position was also attacked by another soldier bug. 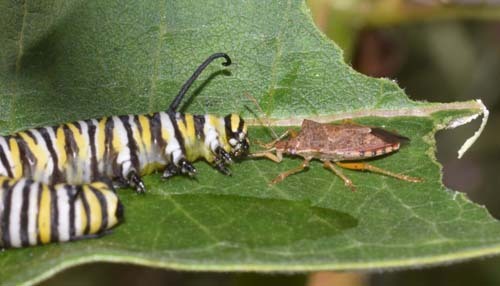 Many other caterpillars at various stages of development were present, as well as fairly numerous spined soldier bugs. However, no other attacks were witnessed and no black caterpillar corpses were found for the remainder of the season. It seems the spined soldier bug is not the reason for the monarch long term population decline on our property. 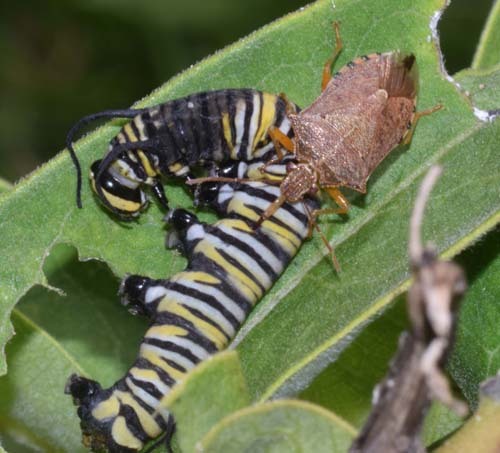 Also, other predators were present in all the milkweed patches, including spiders and an unusual number of preying mantises, yet none were observed preying on monarch larvae. 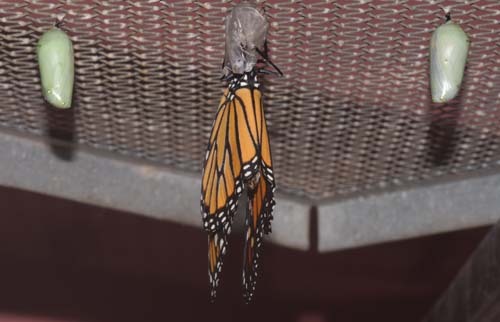 It is likely that they do, since there were far more monarch larvae than pupae. By far, the highest concentration of monarch larvae was found in this small milkweed patch in the backyard. Two other areas where larvae appeared were a small corner of a larger weed field in front of the house and in the small creek meadow. Again, the plants with caterpillars were clustered rather than randomly distributed. 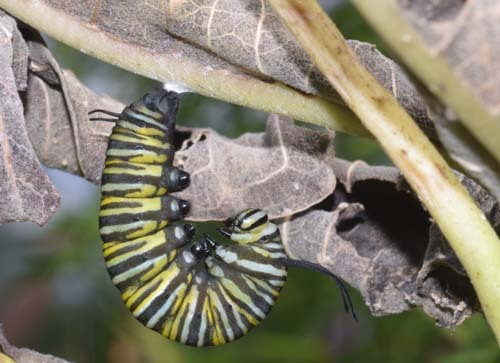 In the satellite image, the heaviest concentration of milkweed is encircled in black and the heaviest concentration of caterpillars is encircled in red. 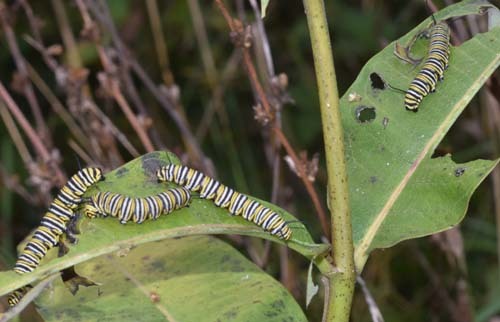 By early September, many caterpillars in the backyard patch were running out of fresh leaves on their milkweed plant. I brought some caterpillars to the house and gathered fresh leaves from the creek meadow where younger plants were still doing well. 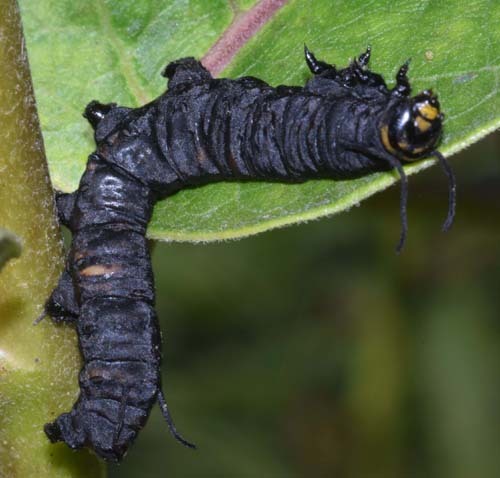 The caterpillars thrived on these leaves and twelve of fourteen matured to adults in an aquarium. One was infected with Ophryocystis elektroscirrha and the chrysalis destroyed. And, one was attacked by something while in the J position, hanging from the screened lid of the aquarium. Two puncture wounds were possibly from a spined soldier bug landing on top of the lid. Its piercing and sucking proboscis could have reached through the perforated lid. Why it left is not clear, but the aquarium had only been outside on the porch for several minutes. A soldier bug had landed on the porch screen door later that day, making it a prime suspect. The caterpillar bled red from one end and green from the other. The wounds appeared within 10 minutes of being moved outside on the porch. There was no predatory insect in the aquarium and several other caterpillars, also in the J position, went on to pupate that day. The first adult to emerge in the house was on Sept 6. The last was on September 29. There were still late blooming flowers in the two wildflower patches as well as the fields. None of my releases were observed going to these flowers, but, hopefully, some of them succeeded in reaching their wintering ground. 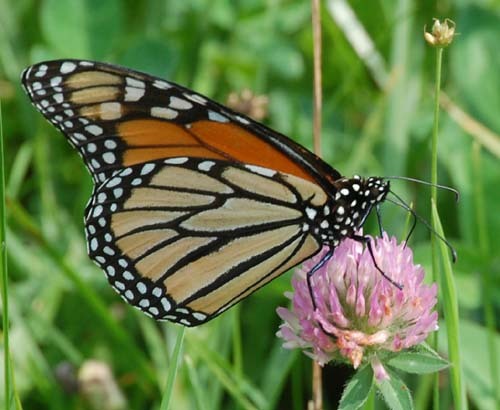 The continent wide population decline of monarchs may only be the tip of the iceberg. Three years have passed since I last saw large numbers of several butterfly species in our yard and fields at the same time. Now, seeing a single swallow tail is cause for excitement. The habitat remains the same. 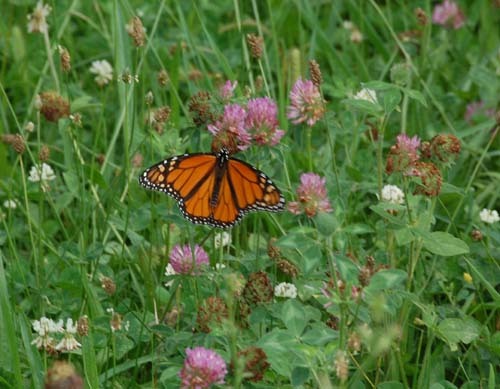 Infrequent rotational mowing allows part of the lawn to always provide good pollinator habitat. Clover, chicory and a variety of wildflowers dominate much of the lawn. And, the mixed wildflower patches are an even more reliable source of nectar and pollen throughout the season. No pesticides are used anywhere. So, obviously, this is not enough. 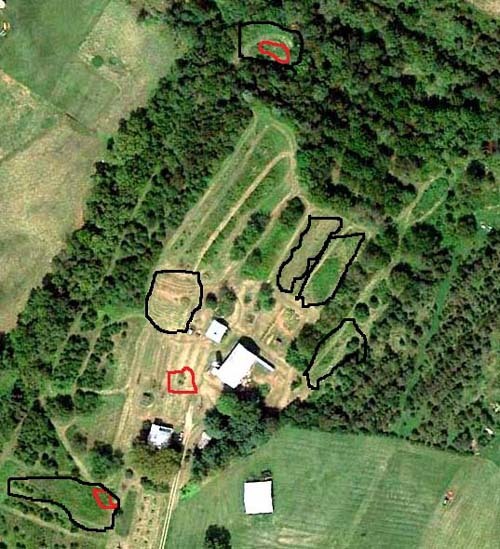 Something else must be going on, perhaps beyond our 17 acres. That must certainly be true in the case of the migrating monarchs. But, it is less clear in regard to the resident species. However, 17 acres is not enough habitat to ensure the continual existence of any one species, even if that species requires only a few square meters to complete its life cycle. The plight of the entire guild of avian aerial insectivores has attracted much attention and research, especially in Ontario, where barn swallow, chimney swift and purple martin populations have been in steady decline for years. Our purple martin colony is, so far, thriving and expanding, but our barn swallow colony is a cause for concern. As I write this in early January, 2018, the temperature is 1° F and the ground has no protective snow cover. Hopefully, this will be a good year for insects and for all of us who rely on them for a healthy biosphere. 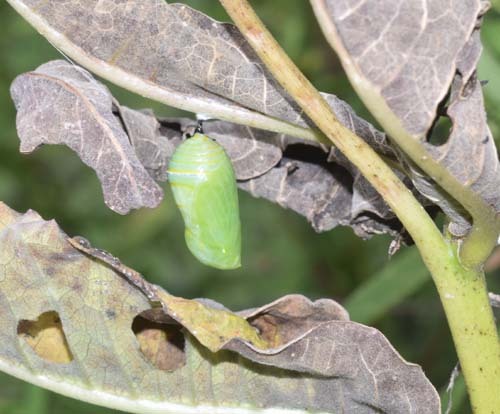 Some milkweed plants had many Monarch larvae. 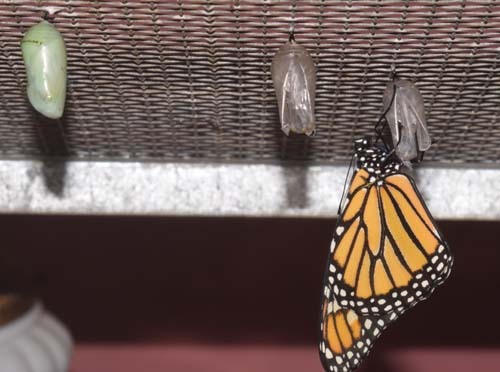 Monarch in J position, ready to pupate. 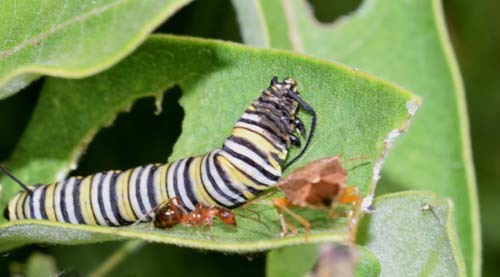 The caterpillar's weight is carried by the soldier bug's proboscis as it clings to the milkweed stem. 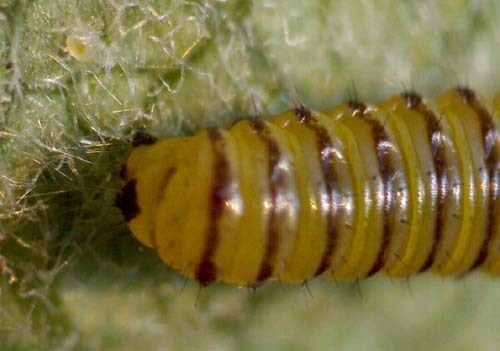 The soldier bug makes numerous punctures along the caterpillar's body. 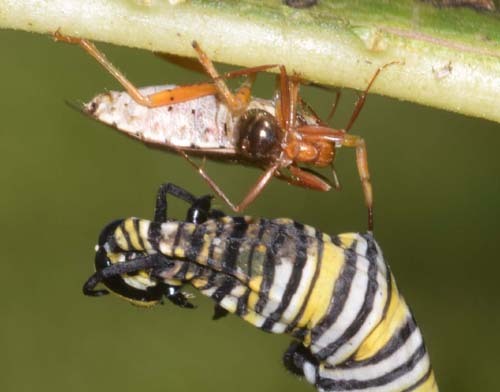 The monarch body turns black even before the soldier bug finishes its meal. Late season monarch larvae were brought indoors for their last meals of fresh leaves before pupating.